It's great to see more land has been allocated for this skatepark compared to the recently completed Woodlands skatepark. Also note the ramps are built by Rhino-Ramps and imported by Playpoint. These are the same ramps as Queenstown skatepark. Look at all those transitions (quarter pipes & banks). Perhaps a little too many. According to the Active Park skatepark blueprints there are only 3 grinding obstacles and around 10 transition obstacles. This is definitely a miss match if you ask us! There is a flat ground rail, one curb and a funbox rail (flat down). This pyramid is in a completely wrong position! We know a lot of you have already been complaining about this obstacle on Facebook and we completely agree with you. There doesn't appear to be any good angle to approach it and we think it might have been better off purchasing more curbs instead of this. 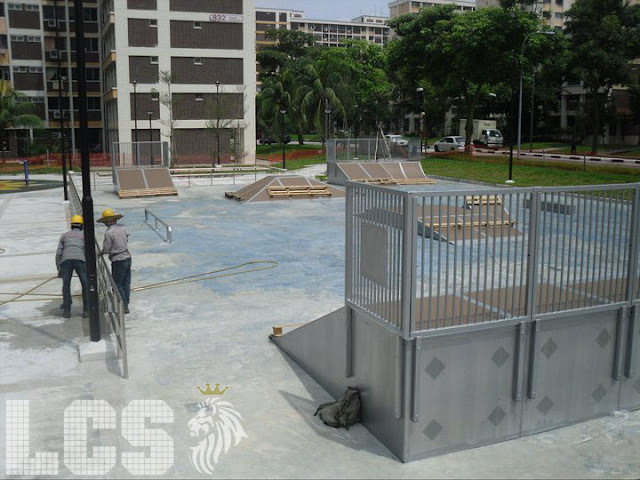 More transitions....With the majority of skateboarders in Singapore and the world identifying themselves as “street skateboarders” skateparks should be designed after real street environments. This means less transition and more curbs, and rails. It would also be nice to see a manual pad. Unfortunately, this skatepark like most in Singapore wasn't designed to duplicate the real street setting that skateboarders love. This funbox will have a rail added to the center. We presume this will be one of the more utilized obstacles but unfortunately, the designer has positioned the quarter pipes and banks incorrectly.The larger quarter pipe needed to gain speed and momentum to approach the funbox has been positioned in a far away corner. Therefore, there is no run up from either side to approach this obstacle with sufficient speed. Either side of the funbox is the pyramid and a bank. Have a look at the second picture above and see what we mean! Here is a good angle showing the almost "un-skateable" pyramid and the funbox with no quarter pipe to gain speed. This park also really needs 2 grind box's minimum. 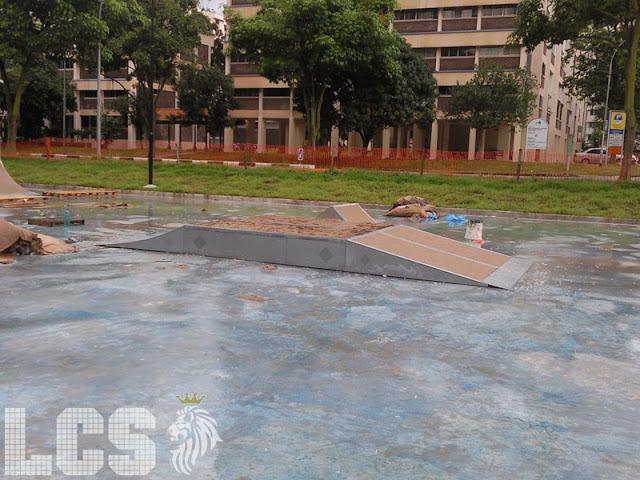 The Yishun -Yio Chu Kang Town Council and Playpoint have not consulted any local skateboarders in the design, layout and choice of the ramps. As a result what could have been an amazing facility has now become a poor representation of what skateboarders in Singapore want and need. In the future an effort should be made to create a dialogue between users of these skateparks, the town councils and builders. With local skateboarder input and involvement when building or renovating heartland skateparks these citizens will develop a sense of ownership and pride. Furthremore, when town councils provide the "correct" facilities it helps the youth feel that the community is addressing their needs and helps them feel more connected and encourages good citizenship. HEY! i see what you mean about the funbox. Once they add a rail in the middle, need speed to grind the entire distance. its just got a bank! and that strange pyramid at either side of the funbox!!!!!!!!!!!! confirm no speed to skate the funbox. please add a manual pad!!!! 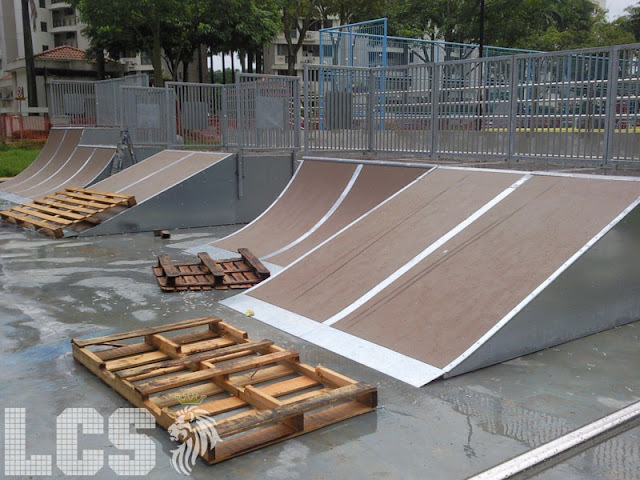 In Singapore, there are lots of "UNUSED" Skate Parks because of poor designs. They might have consulted the local skateboarders saying "we need this and that" in a SKATEPARK. Then next, we might see the blueprint of the park posted looking fine and all that. I agree to this statement "have not consulted any local skateboarders in the design, layout and choice of the ramps" which is true. They might have this kind of attitude "Here's your skatepark. Take it or Leave it." I wish for the next skatepark in Singapore they build, put more effort into it so they won't waste their budget and re-consult the local skateboarders or ask them to come to the actual place to give opinions while constructing it. Join 2 of the flat banks. This will make it wider, easier to skate and more fun. Join 2 quarter pipes that are the same height. Again, more fun and it allows for longer grinds. At the moment, it looks like the quarter pipes are only good for stalls. If they join the same sized ramps together we can grind and slide on the coping. If they fix the above I think the park will be more in tune with what street skateboarders are looking for in a skatepark. We are greatful Singapore is building more parks and made effort doing it. But it's about the principles the people who are going to use it. Sometimes we do need to point out the mistakes so they won't get repeated for future parks like for example Bukit Batok block 108 skate park and Jurong West block 849 skate park. Does anybody really bother going there or it came across their minds to skate there? For some YES because they don't really have much choices. They rather skate the park than getting caught by the cops skating street. Yes, Of course we are grateful. It's great to have a skatepark at Yishun. But lets keep in mind, that no one is asking the community for their input. This skatepark might look good on paper and to people that don't skateboard (residents, passers-by) but the ramps are in incorrect positions. And only 1 curb for a park that size is just wrong!! Playpoint presumably made a nice amount of profit selling these ramps to the town council. Playpoint knows nothing about skateboarding... they get all the money and provide these ramps which are incorrectly thought out..
No problem with Playpoint getting the money. They the distributor, but for them not to seek out the advice of skateboarders is not professional. The town council is also to blame in not creating a conversation with the skaters.. I'm all for LCS bringing light to these problems. If they don't who will. Next park they build maybe even worse..
Do you think we should not be involved in the decision making process.. I live at Khatib and didnt even know about this place being built. I would have loved to give some input or got my friends together to give them our thoughts. -YUP "the designer has positioned the quarter pipes and banks incorrectly"
They are not skateboarders so they would not know what's needed. Let's just be grateful now we have a place to skate in yishun. Anw when will it be open? why couldnt they have just followed some plans from the website?? Don't you think the person that designs and builds a bridge or a school, should know everything there is to know about bridges or schools. I heard its gonna be completed soon, maybe a few more weeks. but the ceremony isnt until some time later. but im damn excited to have a new park. anything better than nothing. 1. freaking waste of money by building skatepark without consulting the users. 2. more curbs and rails is much more better than so many small ramps. 3. longer rails are needed. the rail as shown is the pic is useless. 4. pyramid is meant for flip tricks but it must be placed at the end of a park if the pyramid isnt design to be approach from both ways. 5. round rails is better than flat rails. Thanks for your feedback. It would be great that you guys can come forward to offer your feedback for future Skateparks. 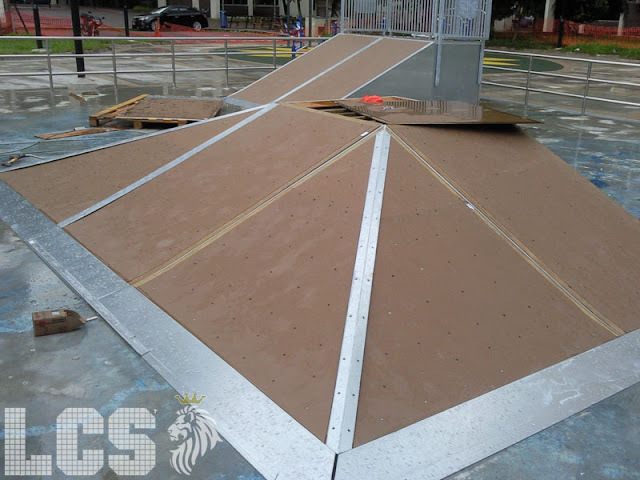 Rhino Ramps are the only company that designs skatepark. Being skateboarders themselves , they understand your requirements. We are having an invitation to invite all skateboarders to participate in the opening of the skatepark on 4th april 2011. When will this skate park be able to use? we need mini ramps just like the ones in woodlands! Its done now & it rocks alot ! for seasoned skaters this park really not got much going.. grind box is too short.. and no funbox or down curb.. pyramid is too big to play on... i mean better than no skatepark but comeon.. They changed the placement of the rail , grind box and the banks . yeah i know.. the placement improved.. but only a bit sia.. i skate here twice already and got bored. the box is still too short.. and only 1..
and the funbox got no side curbs or rail. they could have improved it more. The new yishun skatepark has already open so go skate but bicycle and scooter are not allowed. Any updated photos of the finished park? no a forget to bring my camera and the pyramid have been moved. i mean scooter are allowed. the funbox have already added to the center. why yesterday i saw the skatepark with yellow fences and i put a drain cover.so i saw skaters coming to the skatepark because there a space to come in so i decided to go in. 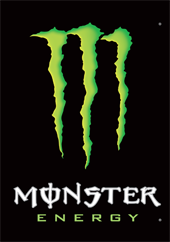 is 20 June 2011 have any competion at any skatepark. hey when is this yishun skatepark going to open again.. i kinda bore evrytime i go there i get caught by the police !!! A mannual pad would be sick. is khatib skatepark going to close down ? like seriously , if they know that this would happen , why bother building a skatepark in the neighbourhood ? then the fence ? the gates ? the time ? WHAT THE ?! I went to the skatepark almost everyday. What I hate is there's a lot of kids go there with nothing use the ramp and pyramid as their playground. The opening hours & closing hours is way too early. And please forbid the non-extreme sports such as waveboard,children bicycle,three wheeled scooter,etc. How to go from yishun mrt? got a updated map? When Will Be The SkatePark Open??? it was build in jan and officially opened in april !!!!!!! The more shytparks they build, the more street we end up tearing apart. Some construction guy must have gone: "oh we'll put this here, and That there, and i think this will be Cute here, and give them more space in the middle so they can have more group pictures of the beautiful park the government built for them. . . ." . . . Fuuulls. can someone tell me yesterday i saw someone skateboard was on the gate and when it still rain no one took it. Hey does anyone go roller blading? Thanks for sharing your effective images. I love your post very much. This images so colorful & beautiful images. Some days ago I got a reviews blog they written about Gold Coast Longboards . It'll be one of the great park for skaters. Extent of the park suitable for skating. Thanks for sharing the images. Anybody arranging skating class in this Yishun skate park at Yishun street 81?